When we are familiar with cabling fundamentals, let’s talk about link speeds. Maximum link speed is determined by the standard. 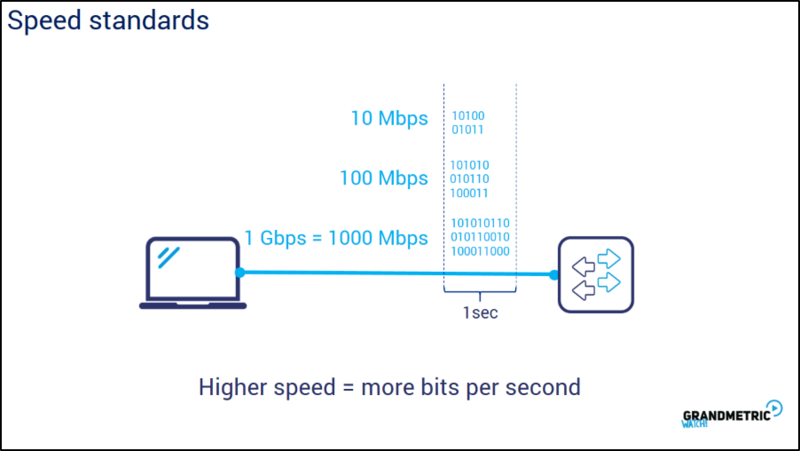 Speed is described with bits per second value meaning how many bits can be sent or received in a signle second. As you remember bit is 0 or 1 represented in short by level of voltage on copper lines or optical wavelength on fiber links. Transceivers are able to quicly change those levels or wavelenght and code the information to efficiently handle many bits within one second. 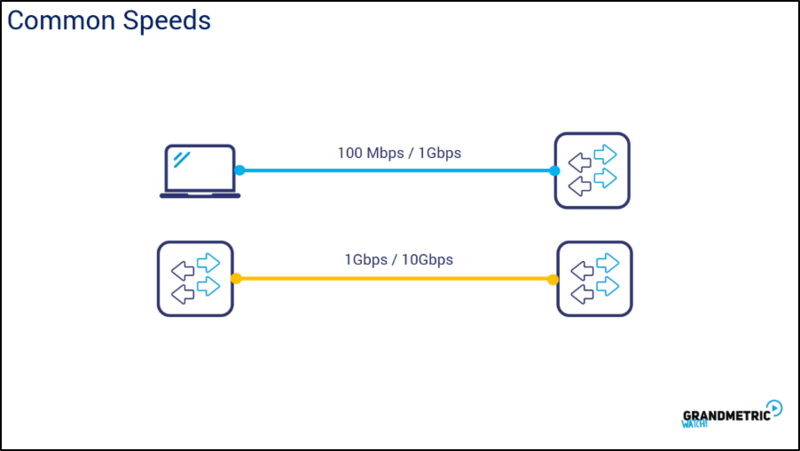 Basically today we can meet 100 mln bits which is 100 Mbps, 1000 milion 1Gbps or 10 000 milion or 10Gig bits per secons speeds in Ethernet but there are also more and less values depending on hardware capabilites and cabling between. The most used link speeds in enteprise networks are 100 Mbps and 1Gbps for end device to switch connections and they are satisifed by copper cabling. For connections like switch to switch or between core devices we can meet 1 gig or 10 gig links and they are often fibers. But it is worth to mention that there 40 Gig links are growng in their populatiry these days used for some core connections. Here you can see a table which outlines the most commonly used standards in enterprise networking today. Maybe except 10 Meg standard that is supported exclusively on old – type devices the rest are in use in every types of networking. 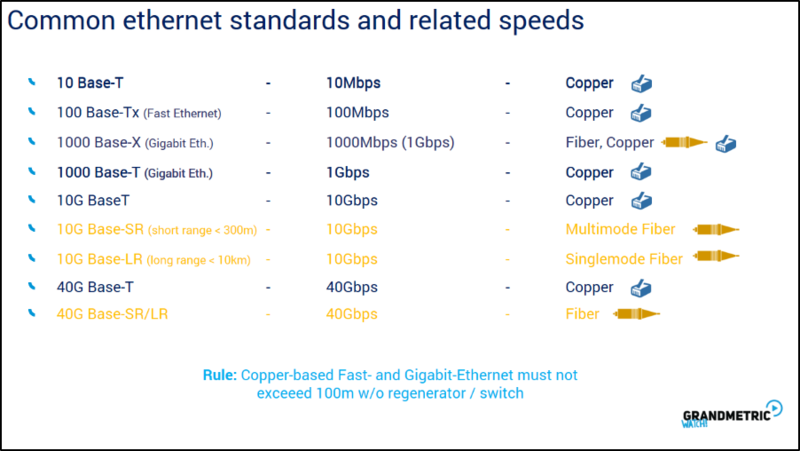 It is worth mentioning that devices supporting 1000 Base T which is copper gigabitethernet are backwards compatilibile with 100 and 10 Meg standards. From the Given Standard name for example 1000Base-T it is very straightforward to recall the parameters provided by this standard. 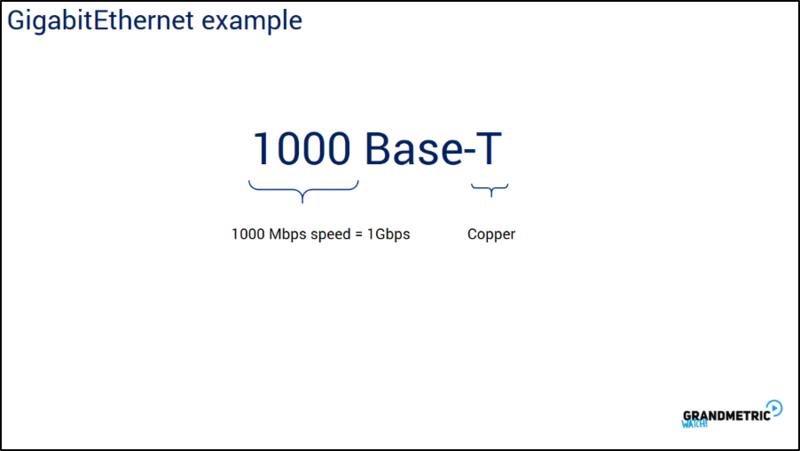 As an example, Gigabitethernet has 1000 in front mening 1000 Mbps that equals 1 Gig per second, the T stands for Copper connection. 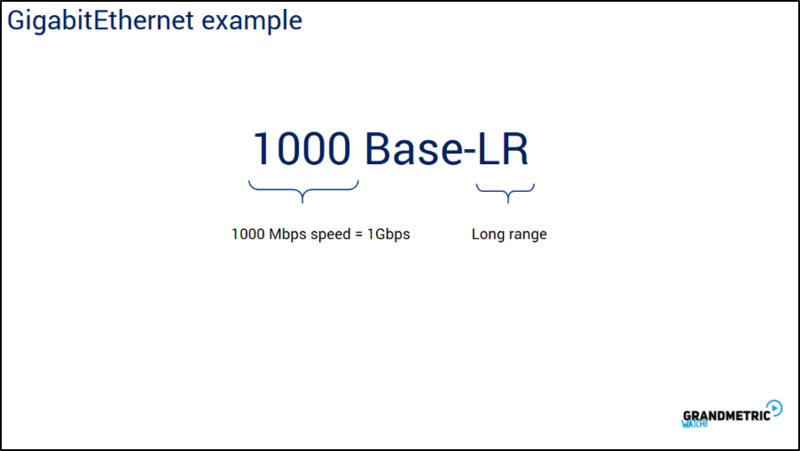 This one is Gigabitethernet has 1000 in front mening 1000 Mbps that equals 1 Gig per second, but LR stands for long range distance fiber connection. 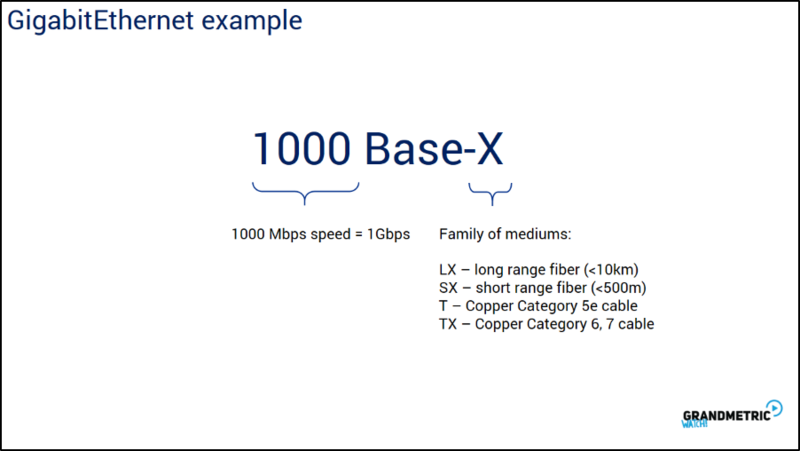 This one is Gigabitethernet but general standard for whole family of mediums: the most common in the faimily are LX stands for long range fiber with distances up to 10km , sx for short range fibers up to 500 metres , T and Tx stand for copper cables. AS you see there is 5e, 6 and 7 category of copper cabling. 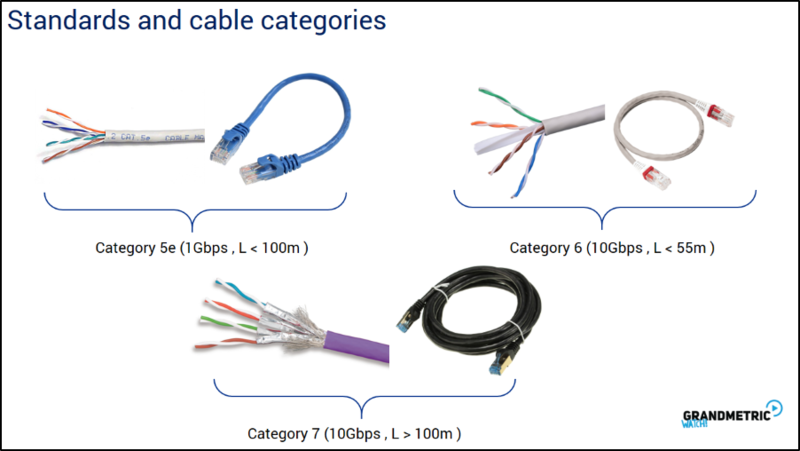 Cable categories are standardized structured cabling that differ between insulations thickeness , connector materials quality and electrical characteristics thus having different propagation delays , speeds and resulting with different link speeds and ranges capabilities. , More solid is the cable higher category i. Category 5e which is most common cabling system has capability to suport maximum 1Gbps speed with maximum of 100 m range. Category 6 has capability of 10 Gbps on copper but length is limited to only 55 metres. Category 7 cabling supports 10Gbps links on distances over 100 m. It is worth to mention that higher category is more expensive that seems to be self-explanatory. If the such collision affects whole goup of devices , we say that the devices create one collision domain. To avoid this collisions set of rules have been developed and defined within protocol called CSMA/CD. 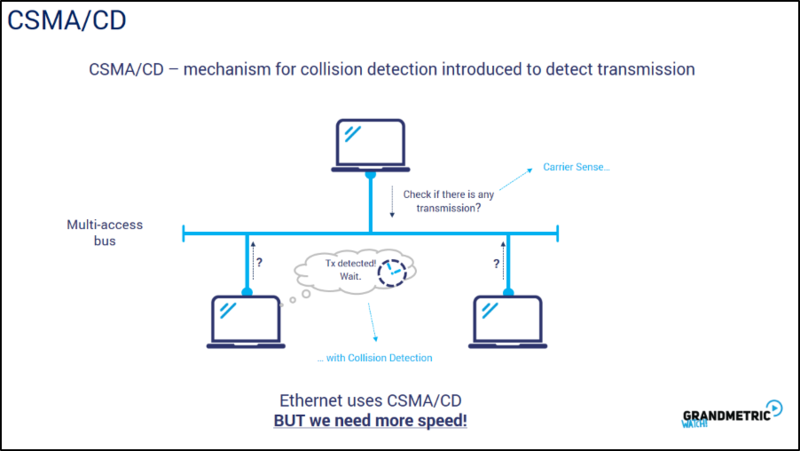 CSMA/CD protocol defines following rule: If device wants to send data, senses the carrier – in other words checks if there is any other transmission on Ethernet bus at the moment. If there is a signal discovered device stops and waits for random time, then tries to send data again. Correct. 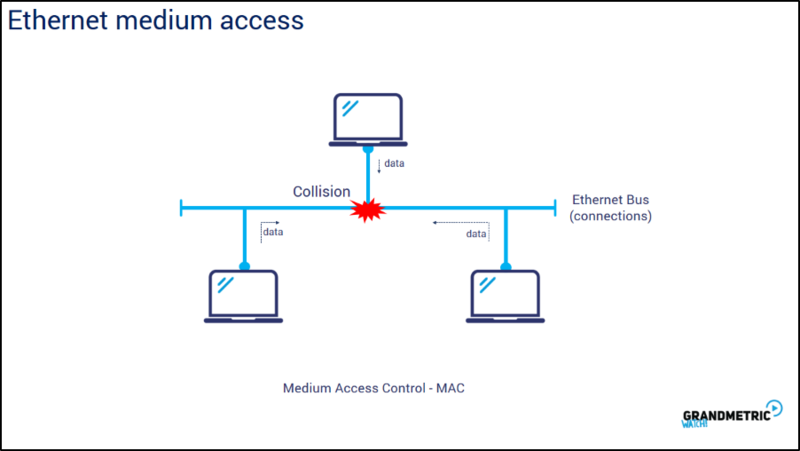 So now we have some mechanism but what if there are many devices connected to same Ethernet bus and every device want to send data very often.? It seems like slow connections and many random back offs, right? Indeed this is something that was a common issue in hub Times. First Ethernet devices served as connecting group of devices together were called HUBs. 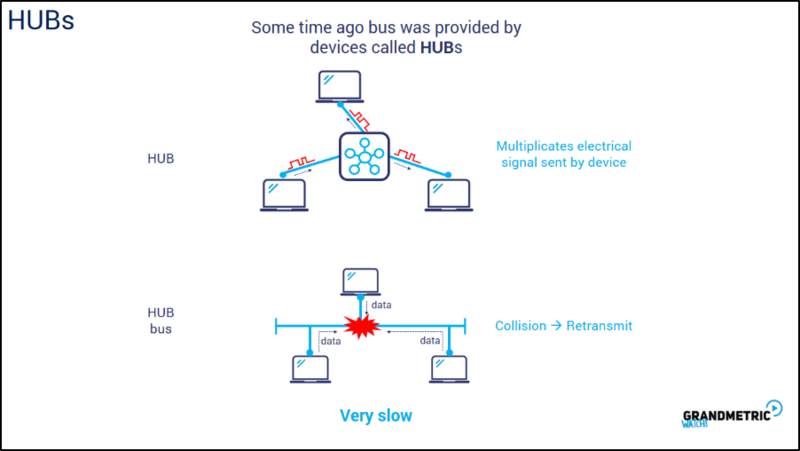 Hub was exectly the implementation of Ethernet bus. In other words they were transmitting the electrical signals without eny logic. Hubs work in Layer 1, physical layer. When one devices sends the signal on a wire, the Hub basically transmits the same signal out of every Ethernet port without any other logic. So this is enforcement of Ethernet bus. But worth noting that this leads to effect that larger the group is higher probability of collision. Hub creates always one collision domains. 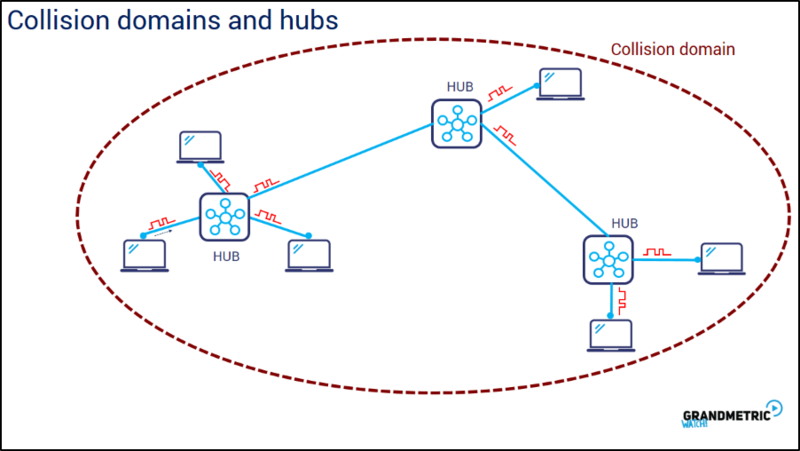 More over if we conect more hubs together they are together still create one collsion domain. 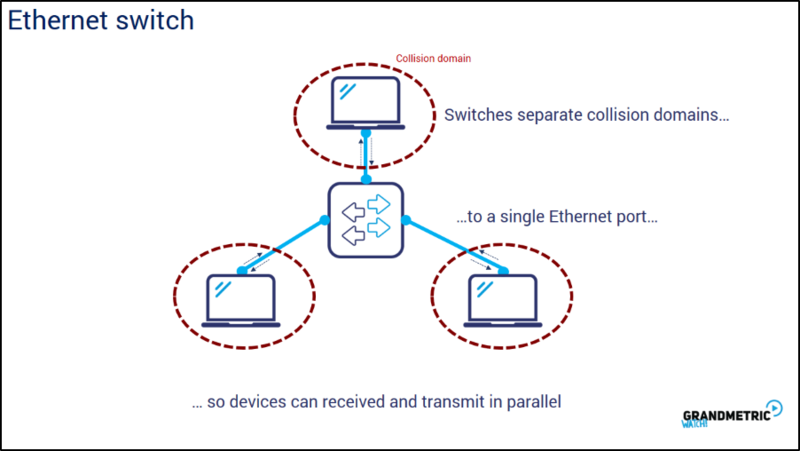 Ethernet switches operate at Layer 2 – Link layer and limit signle collision domain to signle Ethernet port createing one collision domain per devices that’s why no matter how many end devies is conneceted to switch they will never conflict with any other in terms of electrical signals. 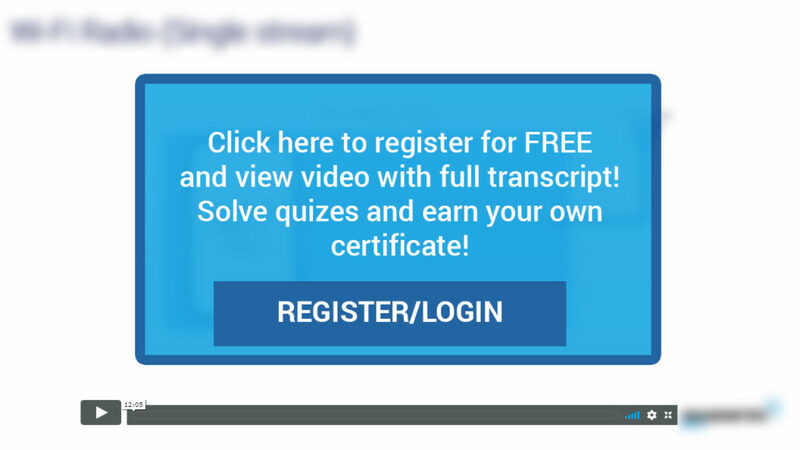 For more informaiton of switch operations whatch „how does switch work” wideo.